Modern Electronics, Mounted in a Classic Console. Yellow cedar planks below the water line and red cedar above were specified an inch and a quarter thick. Bent oak frames were spaced ten inches apart. Laminated deck beams measured three and seven eighths inches in thickness, and spaced just fifteen inches apart. Her original power plants were twin 325 HP GM diesels. She came down the ways with a 16′ 5″ beam, a 5′ 1″ draft, and a displacement of 114,000 pounds. She turned heads underway and in every port. 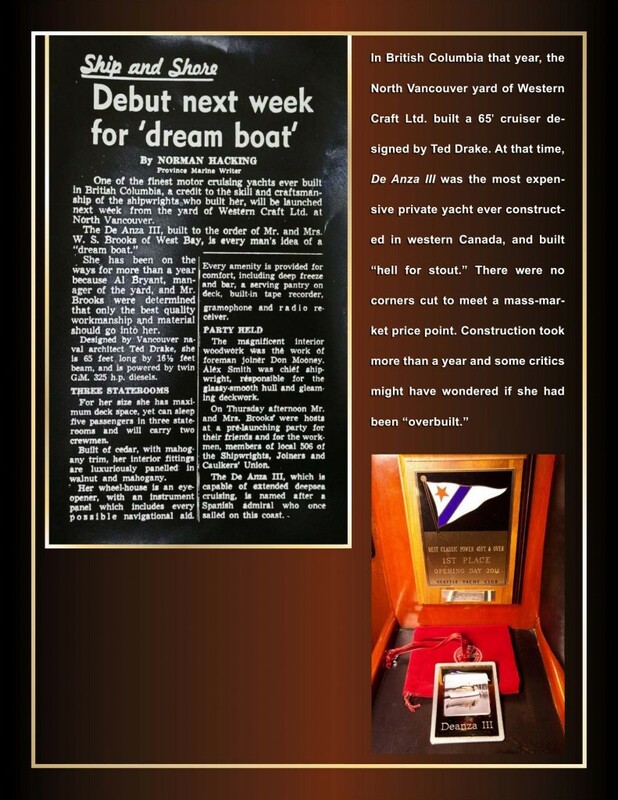 More than a luxurious yacht, she was a grand expression of the shipwright’s art at its zenith. In an era when the finest boats were built of wood, she was considered the finest private yacht ever built in British Columbia. She showcased skills honed for generations, handed down from fathers to sons. Covered Aft Deck with Wet Bar, Barbeque, and More will be Party Central. De Anza III changed hands a half dozen times over the next 55 years. Among her Canadian owners was Hubert Wallace, appointed Lt. Governor of British Columbia by Queen Elizabeth and functioning as her official representative in the province. Rumors have long circulated, but never unquestionably substantiated, that Wallace entertained Her Majesty aboard De Anza III during a royal visit to Vancouver. The original engines were replaced in 1982 with a pair of Detroit 6V92TSA 445-HP diesels. Both of those engines, with a moderate 3850 hours on the meters, are still in place. The serial numbers of the port and starboard engines are consecutive. She reportedly cruises at 14-knots while maintaining fuel efficiency of better than 1 nmpg. Top speed is said to be 17-knots. An Elegant and Comfortable Salon. De Anza III carries 720 gallons of fuel. Tankage for 400 gallons of water is supplemented by a 600-gallon per day HRO watermaker. An Onan 20 kW genset, with sound shield, provides abundant AC power away from the dock. An Outback 5000 watt inverter/charger connects to a bank of 12 200-amp batteries dedicated to house loads. De Anza III still turn heads in every port. A committee of judges at the Seattle Yacht Club declared her “Best Classic Powerboat, 40 Feet and Over” at the Opening Day event in 2011. She continues to draw so much attention that in an interview with Pacific Nor’West Boating her current owner said, “If you want to talk to people, just get on this boat. Everywhere we go, people come out of the woodwork to look at this old classic and make complimentary remarks.” Anybody lucky enough to wrangle an invitation aboard De Anza III will discover a unique ambiance steeped in classic styling coupled with the very latest in modern systems and conveniences. 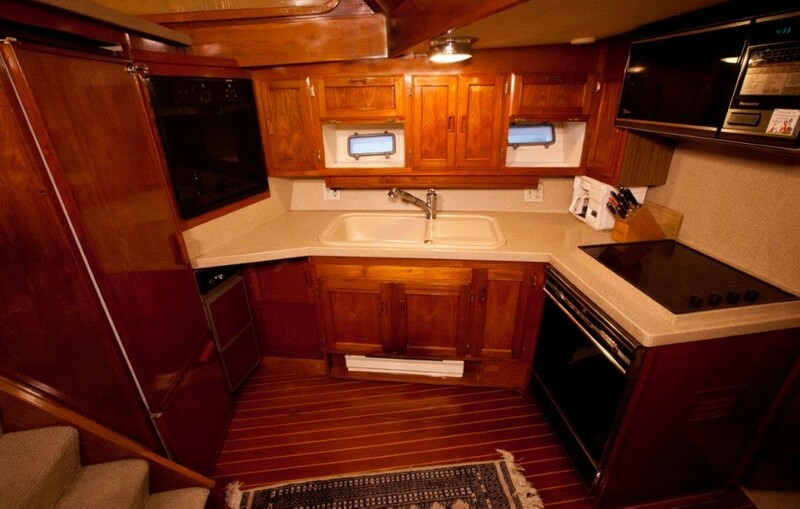 Dinette is opposite the galley for easy serving. 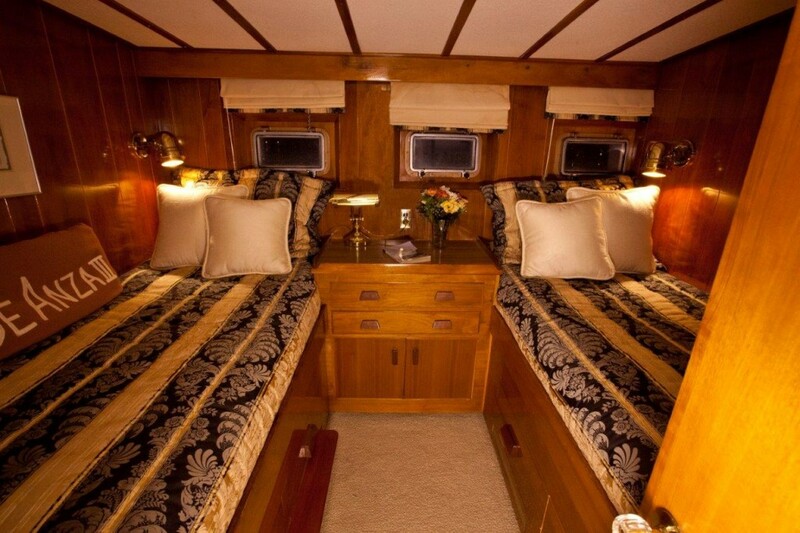 There are three staterooms. 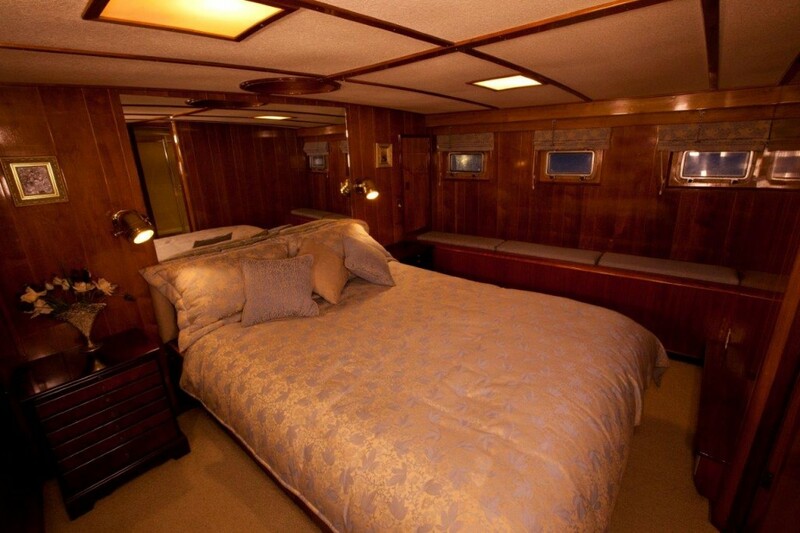 A guest stateroom in the forepeak features single berths to port and starboard. Even this humblest of the three stateroom is configured with first class amenities. Monogrammed towels are a nice touch in the ensuite head, also incorporating custom Corian countertops, stainless sink with American Standard faucet, and an electric marine toilet. The VIP stateroom also features two single berths, separated by a built in nightstand. Down comforters rest atop monogrammed blankets. The ensuite head includes a VacuFlush toilet, a stall shower, and a bathtub. Corian countertops, monogrammed towels, and high quality sink and faucet similar to the guest stateroom complete the amenities. 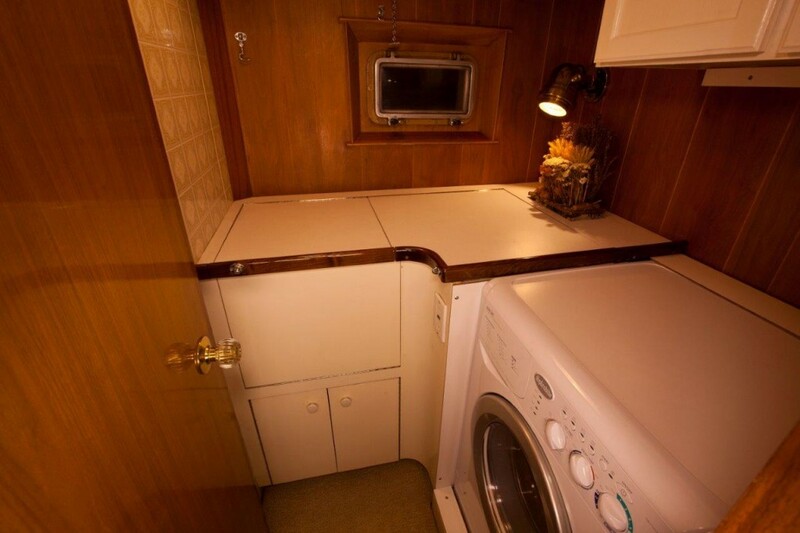 Vintage joinery and high-end appliances in the galley. The master stateroom, most elegant of the three, offers an island queen-size berth with down comforter, and a cedar lined hanging locker. The ensuite head is configured in a fashion similar to the VIP. Galley appliances are all top-of-the line. A Smeg glass cook top with four electric burners and a separate oven by the same manufacturer will address cooking needs. Dual voltage AC/DC refrigeration is by Sub Zero. The trash compactor and stainless steel dishwasher are supplied by Thermador, and there’s an InSinkErator electric garbage disposal. 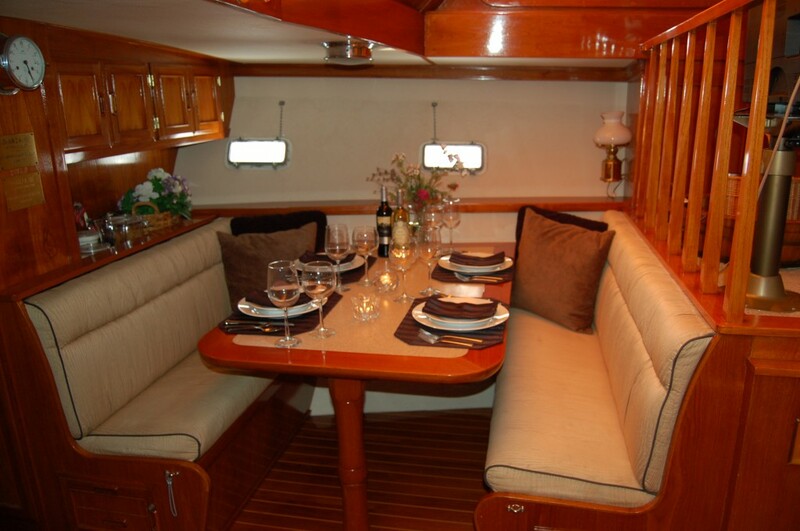 The dinette is conveniently located near the galley, with a teak table and seats upholstered with silk. The salon is arranged with an L-shaped silk upholstered couch to port and two chairs to starboard. A high gloss teak entertainment cabinet, a skylight accented with LED rope lights, and an oriental black lacquer chest table create a memorable and dramatic compartment. Nowhere aboard De Anza III is the melding of old and new any more apparent, or more successful, than in the pilothouse/command bridge. 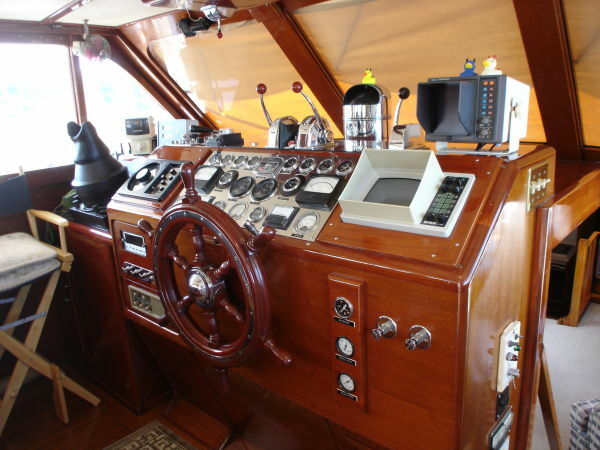 A classic, spoked, ship’s wheel on a centerline helm fixture is surrounded by state of the art navigation systems. There is no sense of clutter, and nothing appears carelessly “tacked on.” It’s almost as if the shipwrights at Western Craft foresaw the future and left an abundance of space for systems and components most modern yachtsmen now consider essential. The protected deck space created by the addition of the hardtop aft of the command bridge is put to exceptional use. It’s obvious that when a party breaks out aboard De Anza III, it will likely begin here. A teak table, two separate ice chests, and a Magma Barbecue nicely complement a Corian wet bar with stainless sink, Sub Zero refrigerator, and freezer. Custom lighting and skylights will help brighten the aft deck on even an overcast Northwest day. 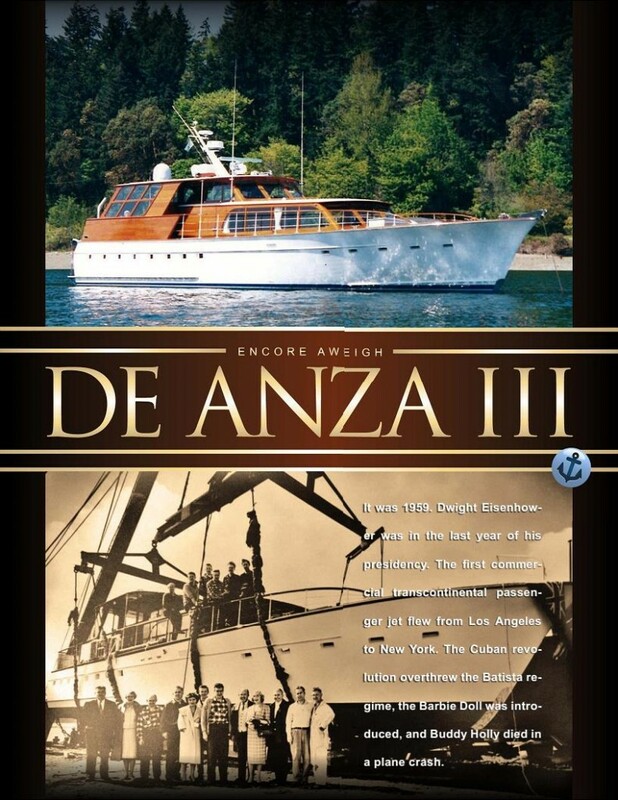 De Anza III is in search of her next owner. 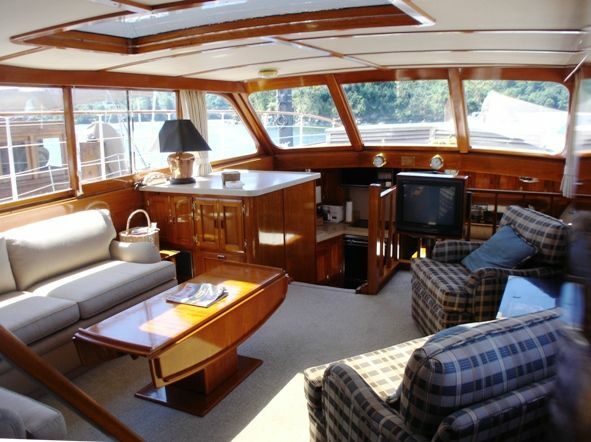 She is represented by Ocean Trawler Yachts in Seattle, and listed for $359,900. 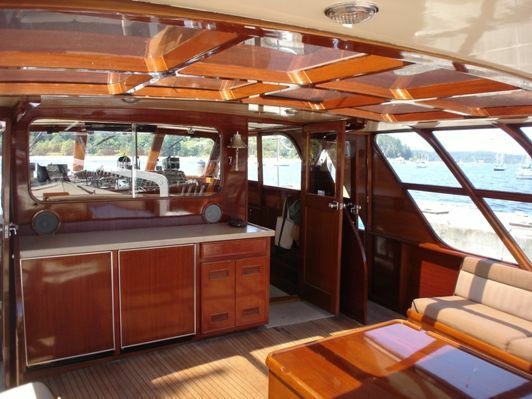 For more information, please call 206-659-0710 or visit their web site at oceantrawleryachts.com.